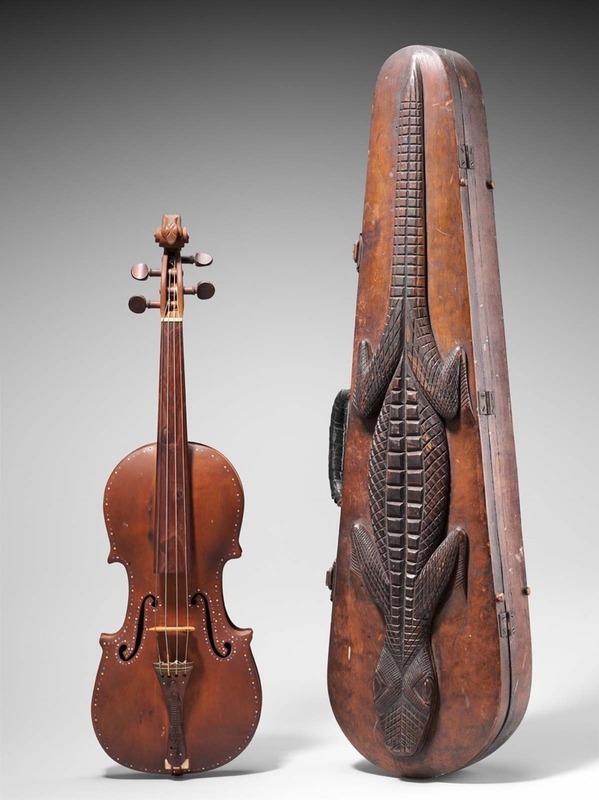 The MFA’s Musical Instruments Collection contains over 1,100 examples from around the world, ranging from ancient times to the twenty-first century. 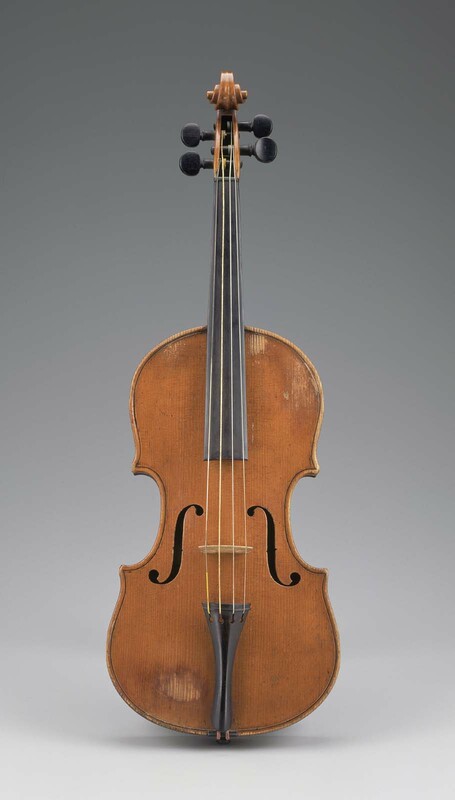 Explore a selection of bowed string instruments from the Museum’s holdings. Two-piece back and ribs of maple. 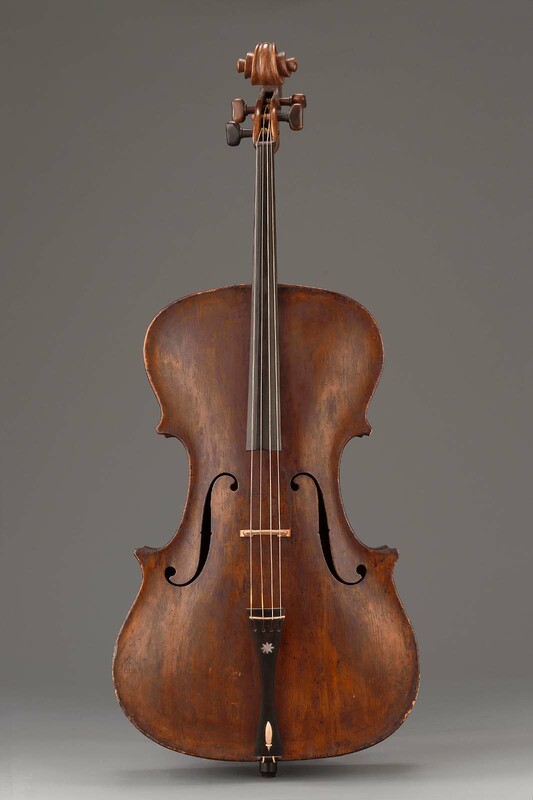 Two-piece belly of fine-grain spruce (attributed to Carlo Tononi in Bologna, about 1700). Regular purfling. Neck and pegbox of maple. Fingerboard, nut, saddle, and end button of ebony. Tuning pegs and tailpiece of boxwood. Medium-brown varnish. Internal construction: Normal modern. Gift of Arthur E. Spiller, M.D. One-piece back and ribs of maple. Two-piece belly of fine-grain spruce. Regular purfling. Neck and pegbox of maple. Fingerboard, tailpiece, nut, saddle, and end button of ebony. Tuning pegs of boxwood. Medium-brown varnish. Internal construction: Normal modern. Two-piece back and ribs of maple. Two-piece belly of fine-grain spruce. Regular purfling. Neck and pegbox of maple. Fingerboard, tailpiece, tuning pegs, nut, saddle, and end button of ebony. Yellow-brown varnish. Internal construction: Normal modern. Two-piece back and ribs of maple. Two-piece belly of fine-grain spruce. Regular purfling. Neck and pegbox of maple. Fingerboard, tailpiece, nut, saddle, and end button of ebony. Tuning pegs of boxwood. Orange-brown varnish. Internal construction: Normal modern. Two-piece back of maple with medium curl descending slightly from the joint. Ribs and neck similar. Two-piece belly of medium grain spruce. Traditional purfling. Tuning pegs (later), fingerboard, nut, and saddle of ebony. Dark brown varnish. Traditional interior construction. Printed label: MADE BY / IRA J. WHITE, / BOSTON. [handwritten: 1835]; In ink on back: I J White. One-piece back and ribs of maple. Two-piece belly of fine-grain spruce. Traditional purfling with additional purfling at seam of lower bout. Neck and pegbox of maple; sides of pegbox carved with foliate designs. Fingerboard, tailpiece (later), nut, saddle, and end button of ebony; end button with pearl dot. Tuning pegs of rosewood inlaid with abalone in floral design. Yellow-brown varnish. Internal construction: Normal modern. Gift of Joseph A. Muise, Sr.
One-piece back of slab-cut maple. Ribs similar. Neck of maple with medium irregular curl. Two-piece belly of wide grain pine. Very faded painted purfling. Scroll has narrow ears and little undercutting. Back of pegbox has shallow channels. Saddle of ebony. Yellow-brown varnish. Interior construction: Footed neck on platform carved from back. Very narrow liners and very small corner blocks. Bass bar angled from bass side to center seam. One-piece back and ribs of maple. Two-piece belly of irregular-grain spruce*. Regular purfling. Neck and pegbox of maple; shallow channels on back of pegbox and thick lip at bottom. Wide ears on scroll. Thin wedge (2 mm maximum thickness) between neck and fingerboard. Fingerboard, tailpiece, tuning pegs, nut, saddle, and end button of ebony. Two lateral score lines near bottom of fingerboard. Red-brown varnish. Internal construction: Normal modern. Two-piece back and ribs of maple. Two-piece belly of medium-to-wide-grain spruce*. Regular purfling. Neck and pegbox of maple. Fingerboard (later), tuning pegs, nut, saddle, and end button of ebony. Shaded red-brown varnish. Internal construction: Normal modern. Two-piece back of maple with medium curl descending from the joint. Ribs and neck similar. Two-piece belly of wide-to-medium grain spruce. Purfling of one strip each of dark and light wood. F-holes roughly finished. Flat slab of birch (?, probably later), 3 mm. thick, between neck and fingerboard. Tuning pegs, fingerboard, tailpiece, nut, saddle, and end button of ebony; the pegs and end button with mother-of-pearl dots. Yellow-brown varnish. Traditional interior construction except for flat neck block with chamfered corners, resting on platform carved from back (originally footed neck?). Two-piece back and ribs of maple. Two-piece belly of medium-grain spruce*. Regular purfling. Neck and pegbox of maple. Fingerboard, tailpiece, tuning pegs, nut, saddle, and end button of ebony; pearl dots on pegs and button. Orange-brown varnish. Internal construction: Normal modern. Two-piece back of maple with wide curl descending from the joint. Ribs and neck similar. Two-piece belly of medium grain spruce. Traditional purfling. Tuning pegs (none matched), fingerboard, tailpiece, nut, saddle, and end button of ebony. Orange-red varnish on golden ground. Traditional interior construction. One-piece back of maple with narrow curl ascending from left to right. Ribs and neck similar. Two-piece belly of medium grain spruce. Traditional purfling. Tuning pegs (two matched), fingerboard, tailpiece, nut, saddle, and end button of ebony. Dark red-brown varnish over golden ground. Traditional interior construction. One-piece maple back, purfled. Ribs of maple. Belly of two pieces of spruce, finely arched, with two f-holes and purfling. Standard type neck and scroll. Ebony finger-board and tail-piece. Standard small fittings. Four strings. Tuning pegs of boxwood of the old-fashioned viol type. New bridge. Standard fittings inside. Yellowish-brown varnish. One-piece back of slab-cut walnut (?). Ribs of walnut. Neck of plain maple. Large, crude scroll. Inside of pegbox painted black. Two-piece belly of fine grain pine (?). No purfling. F-holes widen at center and have offset notches. Later tuning pegs of ebony. Fingerboard, tailpiece, and nut of hardwood painted black. End button of hardwood. Later bridge and soundpost. Later (?) thick red-brown varnish. Interior construction: Footed neck on platform carved from back, with large block along each side. Wide, hemi-spherical bottom block. No liners; ribs apparently butted to back and belly. Smallish corner blocks. Short, thin bass bar. 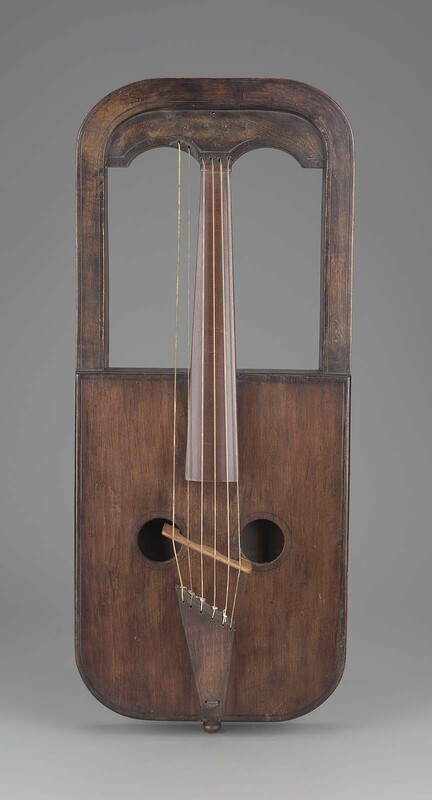 Associated with the instrument are four old tuning pegs (three homemade and one commercial), two old bridges of unusual design (each has only two holes in center, instead of heart-type cut-out), an old removed repair from the treble side of the pegbox, a soundpost of unusual design, an old bow frog, and an old wood coffin-type case. Two-piece back of bird’s-eye maple (highly arched at waist). Ribs similar. Neck of plain maple. Large wedge of maple (13 mm. maximum thickness) between neck and fingerboard. Unusually carved volutes on scroll. One full-width channel on back of pegbox. One-piece belly of slab-cut pine (?). No purfling. Elongated F-holes, attached at upper end (originally attached at lower end also, but cut away). Tuning pegs, fingerboard, and tailpiece (all later?) of ebony. Nut, saddle, and neck heel of bone. End-button and bridge (later) of maple. Interior construction: Rectangular upper block with rounded corners. Lower end of base of neck (and possibly upper end also) has tenon projecting into upper block, apparently reinforced or repaired by hardwood peg (8 mm. diameter) through upper end of back. Rectangular lower block with rounded corners. Square-section liners, joined to back and belly with wood pegs. Bass bar and soundpost apparently later. Two-piece back and ribs of maple. Two-piece belly of fine-grain spruce. Regular purfling. Neck and pegbox of maple. Fingerboard, tailpiece, nut, saddle, and end button of ebony. Tuning pegs of rosewood with buttons of ivory. Endpin of steel with collar of maple. Reddish-brown varnish. Internal construction: Normal modern. Two-piece back and ribs of maple. Two-piece belly of fine-grain spruce. Regular purfling. Neck and pegbox of maple, terminating in carved head of bearded man with hat. Fingerboard, tailpiece, nut, saddle, and end button of ebony. Tuning pegs of rosewood. Endpin of ebony with adjustable point of steel. Yellowish varnish. Internal construction: Normal modern. Two-piece back of maple with medium curl descending slightly from the joint. Ribs and neck similar. Two-piece belly of medium grain spruce. Traditional purfling. Tuning pegs, fingerboard, tailpiece, nut, and saddle of ebony. Metal endpin with walnut collar. Modern type bridge and soundpost. Orange- brown varnish. Traditional interior construction. One-piece back of slab-cut maple. Ribs of maple with faint medium curl. Later neck of maple with wide irregular curl. Original massive scroll with wide ears, made from two pieces of maple. Two-piece belly of wide-grain white pine (seam off-center). No purfling. Large-headed tuning pegs (one later) of stained maple. Fingerboard, nut (both later), and saddle of ebony. Short endpin of maple painted/stained black. Dark red-brown varnish. Interior construction: Later neck block, but platform carved from back for footed neck. Short, closely-spaced pine triangular liners along all of back and much of belly. Small corner blocks (later?). Long thin bassbar (later?) with with additional short and wide bassbar alongside. One-piece back of slab-cut maple. Ribs similar. Crude later neck with crude pegbox/scroll grafted on. Two-piece belly (with wings) of wide-grain (or slab-cut?) pine. No purfling. Later tuning pegs, fingerboard, and saddle of ebony. Old tailpiece of ebony with crude inlaid 8-point mother-of-pearl star, raised lozenge-shaped piece of ivory/bone, and ivory/bone strip above string holes. Later, thick dark red-brown varnish, crudely applied. Interior construction: Later hemispherical neck block, but apparently a platform carved from back for original set-up with footed neck. Wide lower block with chamfered corners. Some liners rectangular (later?) and some shaped. Very large corner blocks. Thin bassbar. One-piece back of slab-cut maple. Ribs and neck similar. Back of pegbox finished flat with incised pattern of half circles at lower edge. Two-piece belly of wide-grain pine. Painted purfling. Shield-shaped tuning pegs of oak or ash stained dark brown, with cone-shaped ivory buttons at ends. 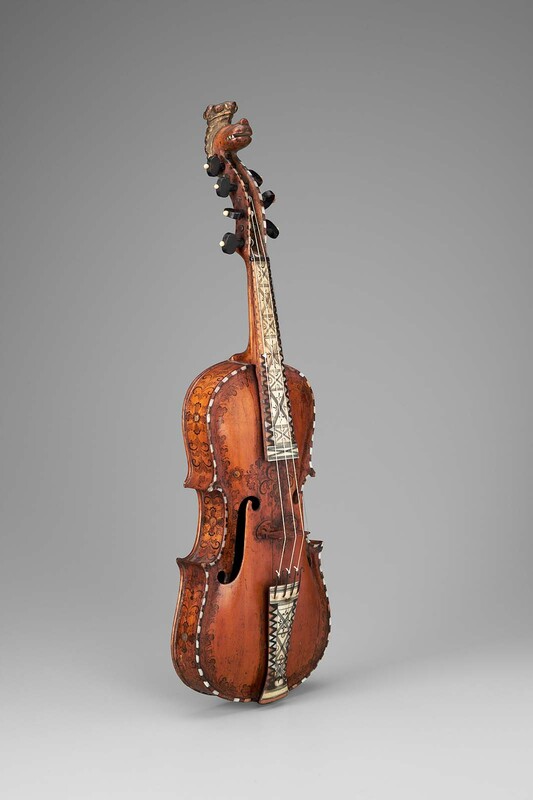 Later fingerboard, tailpiece, and saddle of ebony; the tailpiece with inlaid mother-of-pearl shield. Later nut of ivory. Later metal endpin with rosewood collar. Old maple bridge of unusual design, with one diamond and one triangle-shaped cut-out in the central portion. Later soundpost. Red-brown varnish. Interior construction: Footed neck, shaped to a point and with a hole for a screw (? ), on platform carved from back. Wide lower block with chamfered corners. Rectangular liners and corner blocks. Wide bassbar. Gift of Charles Crehore Cunningham, Sr.
Two-piece back of slab-cut maple. Ribs and neck similar. Seam of lower ribs does not meet at center, but nearly lines up with offset seam of back. Ivory domes (one missing) glued to ears of scroll. Back of pegbox finished flat with incised pattern of half circles at lower edge. Maple wedge (6 mm. maximum thickness) between neck and fingerboard, and later wedge at heel of neck to increase angle to body. Two-piece belly of medium-grain spruce. Painted purfling, interrupted at top of back by series of four crosses and dots. Later tuning pegs, fingerboard, tailpiece, nut, and saddle of ebony. Later steel endpin with rosewood collar. Later bridge. Orange-brown varnish. Interior construction: Later wide neck block with rounded corners, but pointed platform carved from back for original footed neck. Wide lower block with chamfered corners. Thin liners and corner blocks. Bassbar runs in line with grain. One-piece back and ribs of slab-cut maple. Belly of wide-grain white pine. Painted purfling, interrupted at top of back by pattern of crosses and dots. Neck and pegbox of maple. Old fingerboard and tailpiece of maple, painted black; tailpiece with saddle and two inlays (heart- and diamond-shaped) of bone. Later tuning pegs of rosewood (?). Two later bridges of maple. Later endpin of steel. Later reddish varnish, with faux woodgraining on back. Internal construction: Footed neck with point at toe; two reinforcing blocks of wood glued alongside. Wide, flat lower block. Regular liners and thin corner blocks. Two-piece back of wide-grain pine (?). Ribs of plain maple (?). Later neck of maple with irregular curl. Original pegbox/scroll. Two-piece belly of wide-grain pine. Painted purfling, interrupted at top of back by a series of six crosses. Painted purfling also outlining pegbox. F-holes connected at lower end. Tuning pegs (later) and fingerboard of black painted/stained hardwood. Tailpiece of dark stained oak or ash with brass wire “tail-gut” soldered to brass medallion projecting through top. Ebony nut. Endpin socket of rosewood. Later bridge. Red-brown varnish. Interior construction: Later neck block, but platform carved from back for footed neck. Original (?) narrow lower block. Traditional liners (thin) and corner blocks. Bassbar appears to run in line with grain. Two-piece back of wide grain pine with large diamond shape in lower half, created from raised strips of wood. Walnut (?) ribs and neck. Crude scroll with no undercutting; pegbox finished flat down back. Two-piece belly of wide-grain pine. No purfling. F-holes widened at notches and connected at upper and lower ends. Tuning pegs (two extant), fingerboard, and saddle of hardwood painted/stained black; the fingerboard with four inlaid lines of bone to mark finger positions. Short endpin of oak or ash. Red-brown varnish. Interior construction: Neck projects into body deeply (not footed), resting on wood slab (about 5 mm. thick), reinforced by two screws through back. Narrow lower block. Back and belly grooved to receive ribs; no liners except for short pieces along back at waist. No corner blocks. Vertical walnut (?) slabs (about 37 mm. wide) glued to inside of ribs, spaced about 100 mm. apart. Bass bar angled from bass side to center seam. Two-piece back of maple with medium curl descending from the joint (becoming slab cut at edges). Ribs and neck similar. Maple wedge (5 mm. maximum thickness) between neck and fingerboard. Back of pegbox finished flat. Two- piece belly (with wings) of medium-to-wide grain pine. Traditional purfling. Elongated F-holes with offset notches. Brass worm-gear tuning machines with oval heads and brass center rods. Fingerboard of maple (originally painted black). Tailpiece and endpin socket of hardwood painted black. Nut and saddle of ebony. Old maple bridge of unusual design. Orange-brown varnish. Interior construction: Footed neck on platform carved from back, with one screw going downward into platform. Rectangular lower block with chamfered corners. Liners appear to be later; back and belly possibly originally grooved to receive ribs. No corner blocks. Bass bar angled from bass side to center seam. Two-piece back of maple with wide curl descending from the joint; the joint offset considerably from the center. Ribs of maple with some bird’s-eye figure. Neck of plain maple with wedge (4 mm. maximum thickness) between neck and fingerboard. Two-piece belly of wide grain pine. Belly and back very thick and extremely arched. No purfling. Crude F-holes with off-set notches. Scroll ears decorated with small bone finial (one missing). Fingerboard of stained maple with four lines of bone dots to mark finger positions. Commercial tuning pegs of rosewood (one missing). Orange-brown varnish. Nut of bone. Saddle of ebony. Interior construction: Footed neck. Very wide lower block with rounded corners. Back and belly apparently grooved to receive ribs; some liners of short triangular pieces butted to each other. Large corner blocks, each corner joined to block from outside with eight iron round-head screws. Bass bar appears to run in line with grain. Three strings. Outline of viol type. Back of two pieces of maple, flat in lower and middle bouts, then gradually tapering toward the neck bracket. Belly of two pieces of large grained pine, arched, two f-holes, purfling. Both back and belly with overhanging edges. Finger-board of walnut, stained black. Ebony tail-piece. Normal type bridge. Neck and head of one piece of maple. Machine head with three tuning screws. Rest-pin with a steel spike. Inside construction: corner blocks of normal violin type; cross-strip 20 cm. wide and 8 mm. thick, glued to the back opposite f-holes; bass-bar and sound-post. Light yellow-brown varnish. Two-piece back of slab-cut maple. Ribs of bird’s-eye maple. Neck of maple with irregular curl. Two-piece belly of medium-to-wide grain pine. Traditional purfling. Brass worm-gear tuning machines with oval heads and hardwood center rods. Fingerboard, tailpiece, and short endpin of hardwood painted/stained black. Nut and saddle of ebony. Old maple bridge with only two holes (rather than heart shape) for cut-outs. Dull red-brown varnish. Interior construction: Footed neck on platform carved from back. Wide semi- circular lower block. Back and belly grooved to receive ribs; no liners. Very thin corner blocks. Bass bar runs at a slight angle from center to bass side. One-piece back and ribs of maple. Ribs made of one continuous piece, separated at bottom by ebony strip. Two-piece belly of fine-grain spruce. Edges of belly, back, and banana-shaped soundholes bound with ivory and ebony. Back and belly flush with ribs. Neck and pegbox of maple, with reverse scroll. Tuning pegs of rosewood (?). Fingerboard, heel cap, and end button of ebony. Guitar-type string-fastener of ebony with four pins and saddle of ivory glued to belly. Bridge (later) of maple. Yellow-brown varnish. Waist decorated on both sides with polychrome insects. Internal construction: Regular-type liners. Bass bar in regular position. One-piece back and ribs of maple. Ribs of one continuous piece. Two-piece belly of medium-to-wide spruce. No purfling. Back and belly overhang ribs. No notches in F-holes. Neck and scroll of maple. Large scroll with wide ears and steep undercutting. Tuning pegs of walnut (?). Fingerboard, tailpiece (later), nut, saddle, and end button of ebony. Yellow-brown varnish. Internal construction: Footed neck with incurved sides, resting against platforms carved from back and belly. No liners; back and belly grooved to receive ribs. Printed label: MANUFACTURED BY / PETER M. SLOCUM / [handwritten: NO 39 / 1834] / NEWPORT, R.I. Body of guitar form, without corners, with very narrow middle bouts. Back and ribs of maple. Belly of close grained spruce with elongated S-holes. 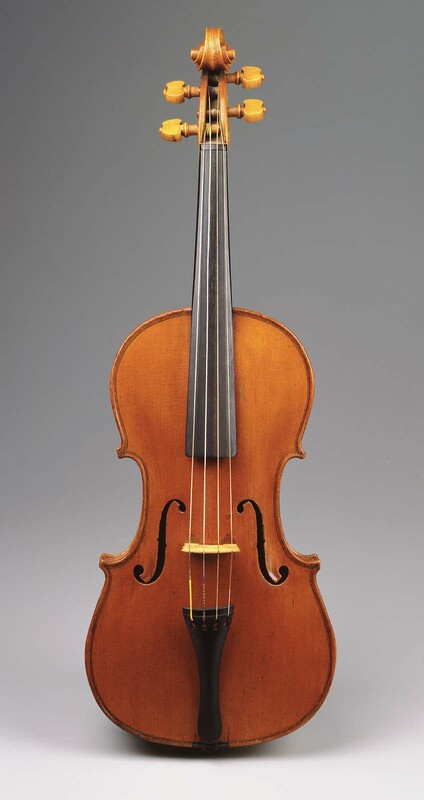 Both back and belly with slight arching, purfling, and edges fitted flush (no overhang, as on standard violins). 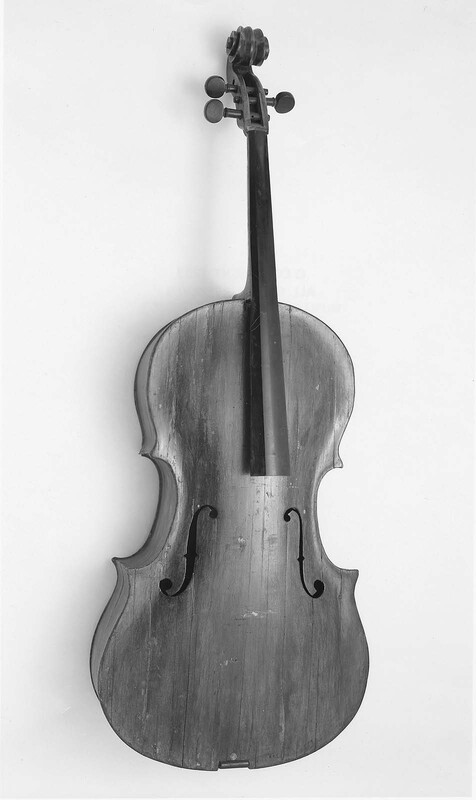 Violin-type neck, with peg-box and scroll of standard pattern. Finger-board and tail-piece of boxwood stained black. 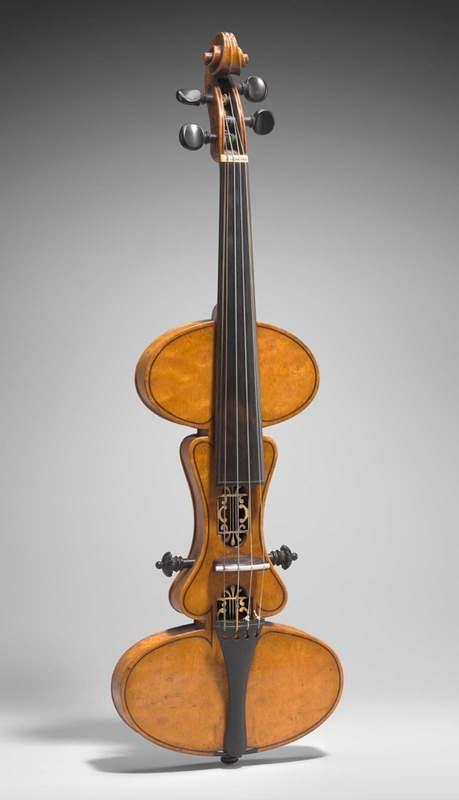 Three-quarter size violin bridge. Inside construction: top and bottom blocks; bass-bar and sound-post. Four strings. Reddish-brown varnish. Body of mahogany. Resonator of aluminum. Fingerboard and tailpiece of ebony. Anchor-shaped frame, without sound-box. Spine-bar, neck, peg- box, and scroll carved out of a solid piece of maple. Chin-rest formed by a separate piece. Ebony finger-board and tail-piece. Bridge with many extra holes for dampening of vibrations. Four strings. Yellow-brown varnish. Cigar-shaped body with flat front, back, and sides, of solid maple, with long cut-outs in upper and lower half separated by septum. Curved maple pieces attached to upper and lower end of body. Maple neck. Tuning pins, fingerboard, tailpiece, nut, saddle, and end button of ebony. Bridge of maple. Orange-brown varnish. One-piece back of maple with irregular curl. Ribs similar. Neck of plain maple. Crude scroll with little undercutting. Two-piece belly of wide irregular grain pine (?). No purfling. Three extant tuning pegs; one commercial of ebony, one homemade of hardwood, and one improvised from the head of a clothespin. Fingerboard of walnut (?). Commercial tailpiece of ebony with inlaid flower of mother-of-pearl. Nut and saddle of ebony. End button of hardwood. Red-brown varnish. Interior construction: Footed neck on shallow platform. Hemi-circular lower block. Regular type liners and corner blocks. Triangular-shaped bassbar. Non-traditional body outline. One-piece back of slab-cut walnut. Ribs similar. Neck of plain maple. Crude scroll with no undercutting. Scroll/pegbox painted/stained brown. One-piece belly of slab-cut softwood, extended onto neck 30 mm. No purfling. Crude F-holes with offset notches. Fingerboard of stained walnut with inlaid five-pointed star of bone; lower half painted/stained black. Tailpiece of bone with carved geometric designs and inlaid dot of mother-of-pearl. Nut of ebony. Homemade tuning pegs of walnut (?) stained black. Dark brown finish; not varnished, perhaps waxed. Interior construction: Footed neck resting on platform carved from back. Very narrow lower block. Belly and back glued directly to ribs with short very widely-spaced triangular liners. Small corner blocks. Non-traditional body outline with extra-wide lower bout. Two-piece back of maple with irregular horizontal curl. Ribs similar. Neck of bird’s-eye maple. Large crude scroll. Two-piece belly of wide-grain softwood. Purfling of one wide strip of wood left raised above surface. Crude F-holes with offset notches. Two tuning pegs, fingerboard, and end button of maple stained black. Two commercial tuning pegs, one of rosewood and one of ebony. Orange varnish. Traditional interior construction. Bass bar angled from bass side to center seam. Non-traditional body outline. One-piece back of bird’s-eye maple. Ribs of walnut (?). Neck of plain maple. Large wedge (6 mm. maximum thickness) between neck and fingerboard. Large crude scroll with deep undercutting. Back of pegbox terminates in an upturned hook. One-piece belly of wide-grain softwood. Back and belly have exaggerated flat area at edges. No purfling. F-hole notches offset and upper hole not connected to curve. Two commercial tuning pegs of hardwood painted/stained black; two homemade pegs of hardwood painted/stained black. Fingerboard (later), saddle, and end button of stained hardwood. Orange varnish. Interior construction: Footed neck, resting on platform carved from back. Belly glued directly to ribs. Short widely- spaced triangular liners along back. Normal-sized corner blocks. Non-traditional body outline. Two-piece back of maple with faint medium horizontal curl. Ribs of walnut. Neck of plain maple. Crude scroll. Two- piece belly of wide grain softwood. Back and belly have exaggerated raised edges. No purfling. F-holes widened at notches. Two extant commercial ebony tuning pegs. Fingerboard, nut, saddle, and end button of stained hardwood. Interior construction: Footed neck sandwiched between two large blocks. Wide flat lower block. Thin flat liners. Small corner blocks. Non-traditional body outline with angular corners and all flat surfaces. Flat two-piece back of slab-cut pine. Ribs similar. Neck of oak. Crude pine scroll with no carving. Back of pegbox open. Two-piece belly of slab-cut pine. No purfling. Crude F-holes with no notches. Tuning pegs, fingerboard, tailpiece, nut, saddle, and end button of stained hardwood. Homemade bridge of oak with carved heart connecting legs. Stained brown with no varnish. Interior construction: Footed neck. Back and belly glued directly to ribs; no liners or corner blocks. 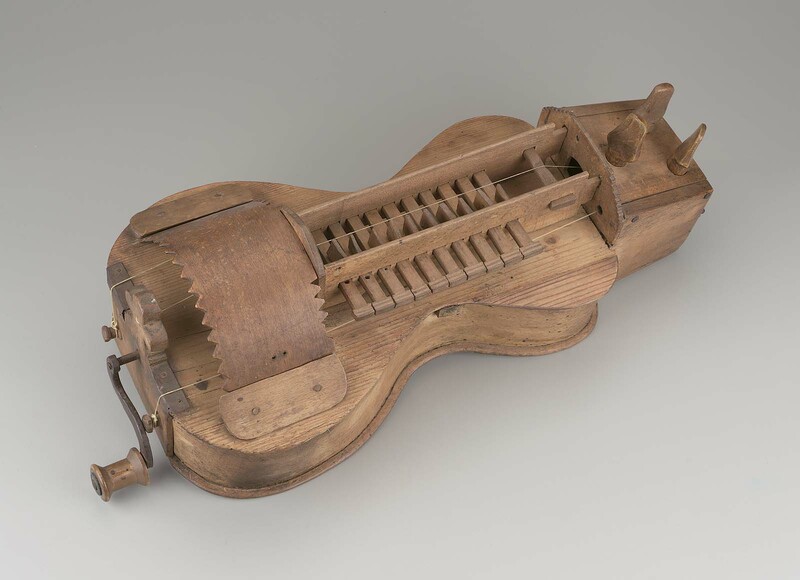 Rudely made instrument constructed from a cigar box by a blind man. Long rectangular box with two long slits for sound-holes; tail-piece and finger-board. Four gut strings. Back comprised of five ribs, each covered with veneer of tortoiseshell and separated by strip of ivory. 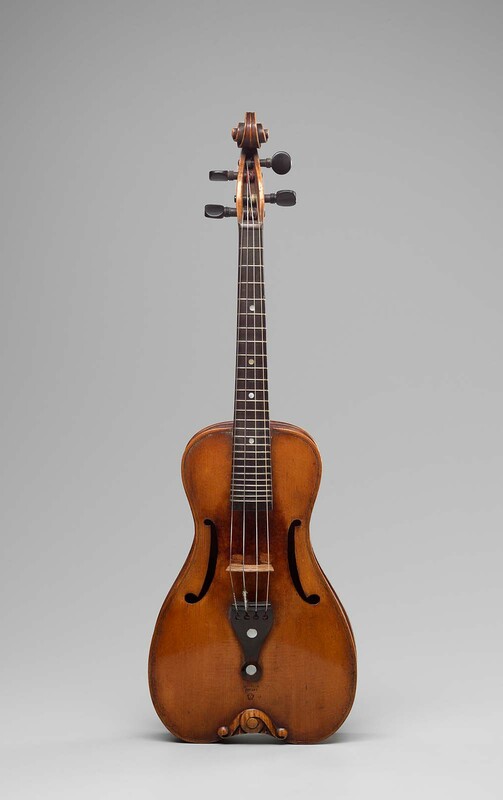 Belly of spruce with two C-shaped soundholes, small rose-shaped soundhole near upper end, and inlaid decoration of red heart, two green leaves, and small flowers. Neck, fingerboard, and tailpiece of wood covered with tortoiseshell veneer. Pegbox of ebonized wood, surmounted by carved ebony head of Nubian woman with red painted lips and separately attached earrings and necklace. End button and collar at join of body and neck of ivory. Tuning pegs of ivory with black incised circle and dot on each face. 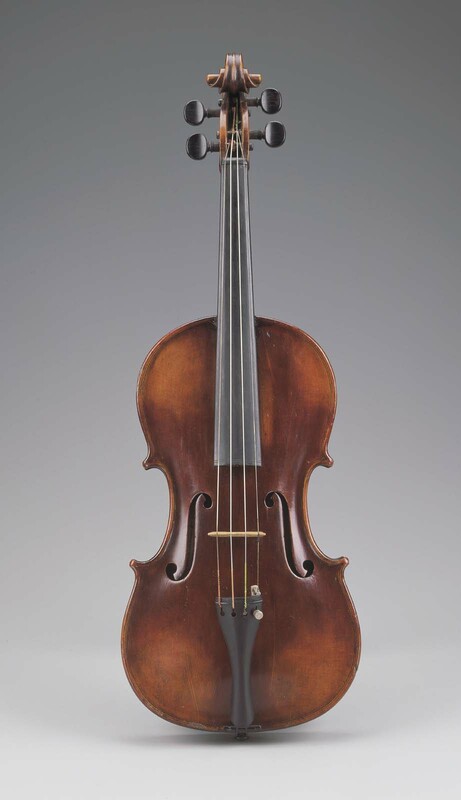 Violin form. Body (back and ribs), neck and peg-box carved out of solid piece of maple. Belly of soft pine with f-holes. Both back and belly are highly arched. Finger-board of ebony. Tail-piece attached to ivory tail-pin. Four strings; movable bridge, pegs of simplified violin pattern. Bass-bar and sound-post. Light yellow varnish. Narrow, elongated boyd of pear wood with five-ribbed back. 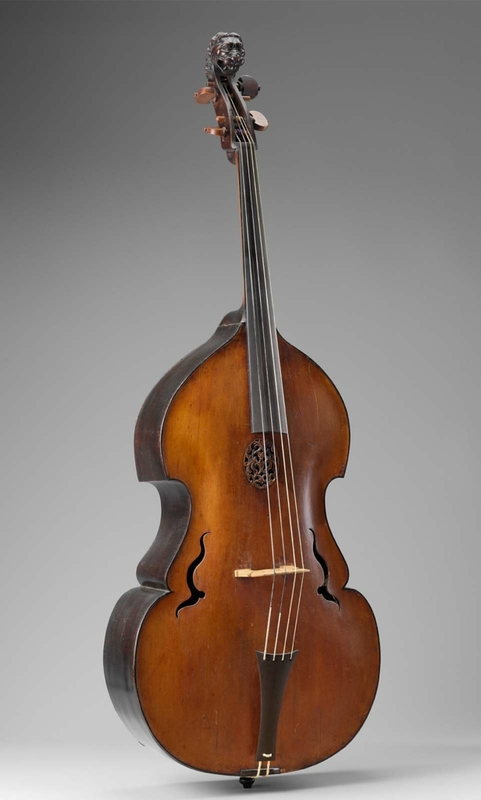 Arched belly with two sound-holes shaped like the figure 3. Neck of pear wood with peg-box. Tail-piece of boxwood, affixed by ivory tail-pin to the lower block through hole in the belly (not at the bottom!). 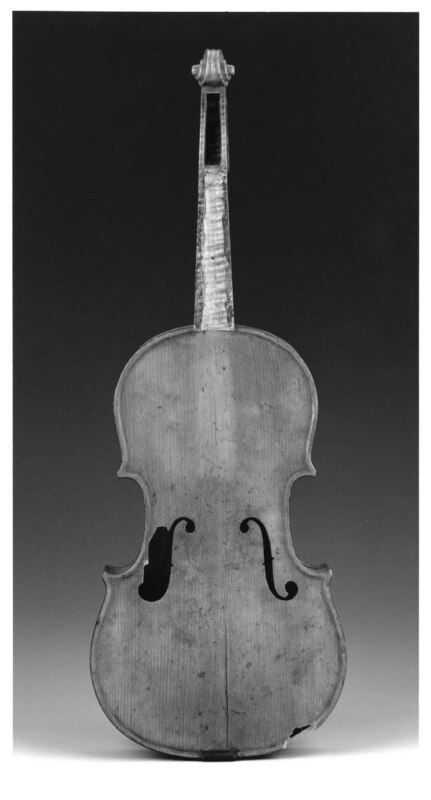 Four gut strings; movable bridge of standard type, but with narrow base; ivory nut. Lateral pegs. Sound-post. Long model with complicated curved outline. Flat back of maple. Ribs of maple, made of five pieces (two upper bouts, two middle bouts, and a bottom piece). Belly of pine, highly arched (especially under the bridge), purfled at edges; three sound-holes, two flame-shaped ones on both sides of the bridge and a small, comma-shaped one under the finger-board. Short neck with clearance groove for sympathetic strings. Finger-board of ebony. Peg- box without bottom, having only two cheeks; surmounted by a scroll (not original); bored for thirteen pegs. 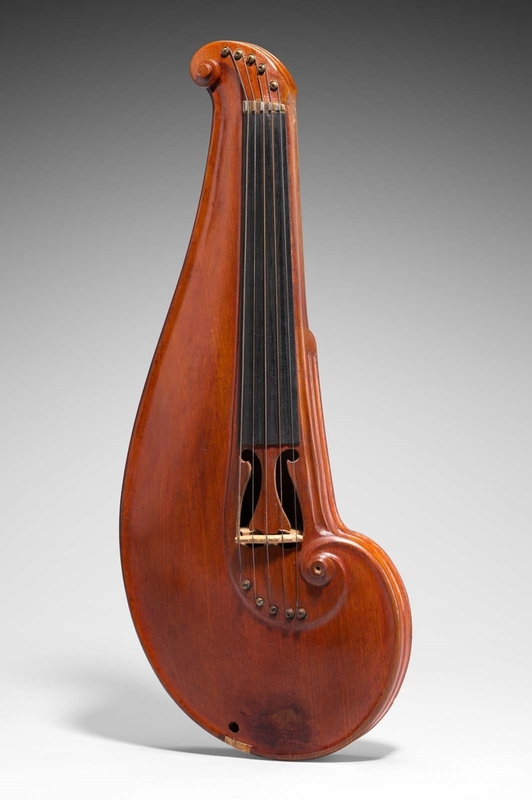 Tail-piece of stained walnut, top cut slantwise, with an ivory reinforcing strip; held by a thick gut-string loop attached to the ebony taip-pin. Two sets of strings affixed as follows: 1. 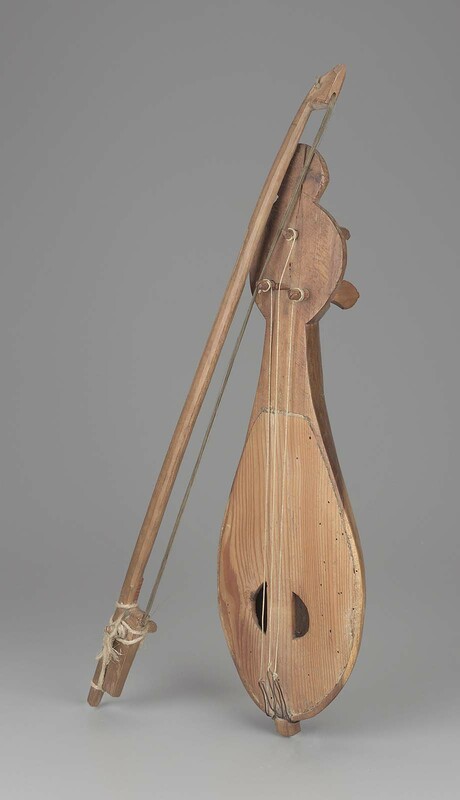 Six playing strings, held by the tail-piece, pass over a movable bridge and an ivory nut to the lower tuning pegs. 2. 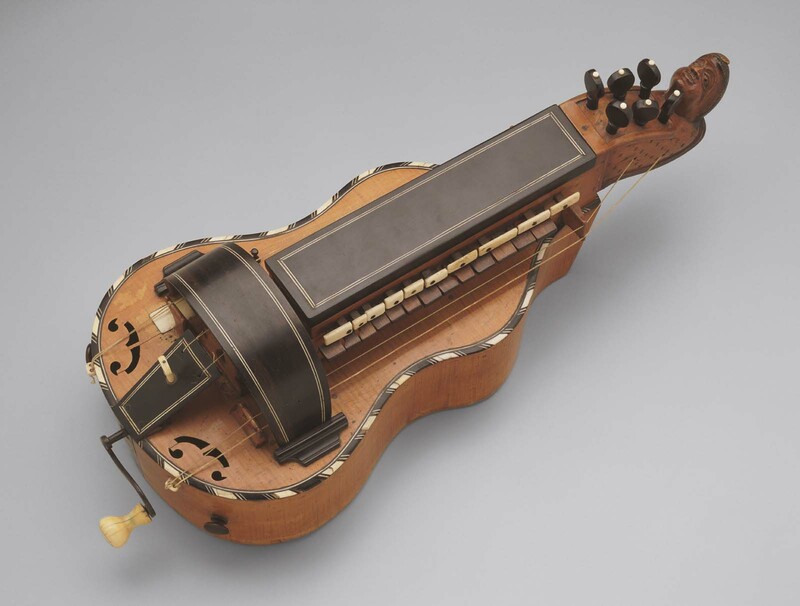 Seven sympathetic strings of thin steel wire, held by small ivory buttons in the bottom, pass over ebony saddle, over ivroy tipped clearance slit in the bridge, through clearance space under the finger-board, over auxiliary boxwood nut under the main one, to the upper tuning pegs. Inside construction: three cross-bars and cross-strip 4 cm. wide and 3 mm. thick, glued to the bottom; at the lowest incurvation the joints of the middle bouts and the lower ribs are reinforced by large blocks. one on each side; bass-bar and sound-post. Dark reddish-brown varnish. 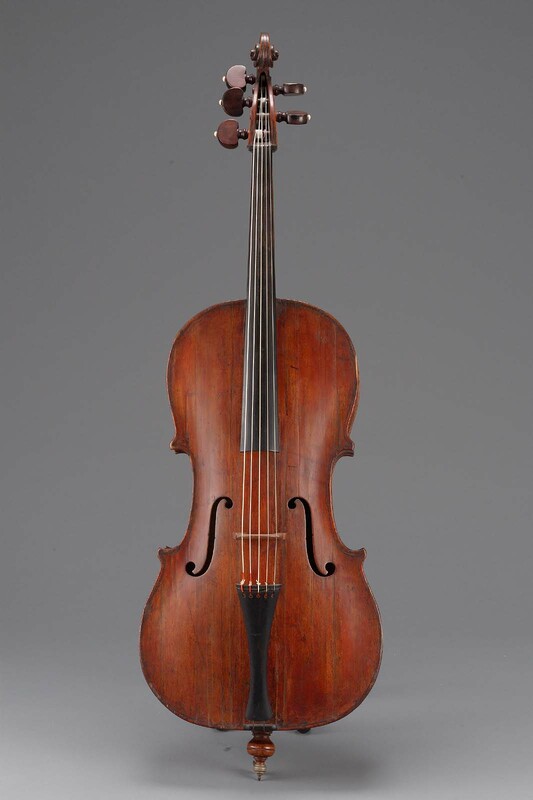 Viol type body, shallow model. Flat back of maple, in two pieces. Ribs of maple. 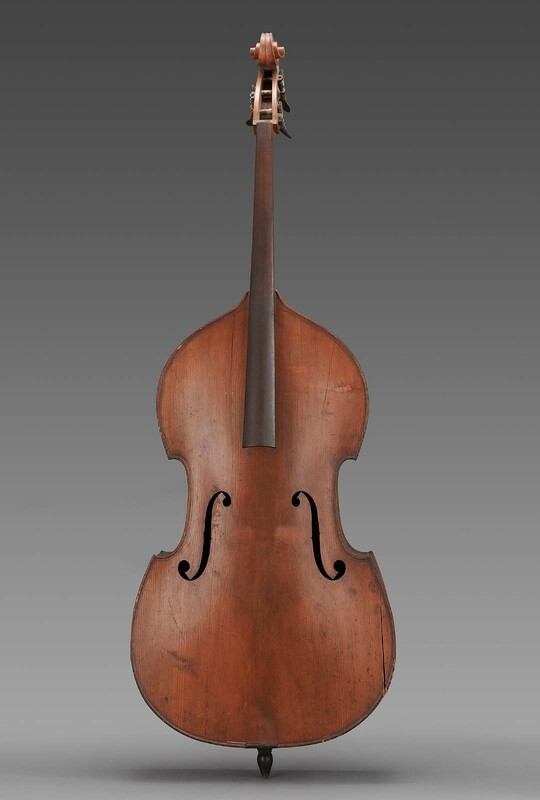 Belly of pine, highly arched between middle bouts; inlaid purfling, flame type sound-holes. Neck of maple with a clearance groove for sympathetic strings. Peg-box integral with neck, slightly tilted toward right, surmounted with blindfolded Cupid’s head; back of peg-box carved and gilded; bored for twelve lateral pegs. Hook-bar of ivory. Tail-piece of ebony, with the top cut slantwise. Two sets of strings affixed as follows: 1. 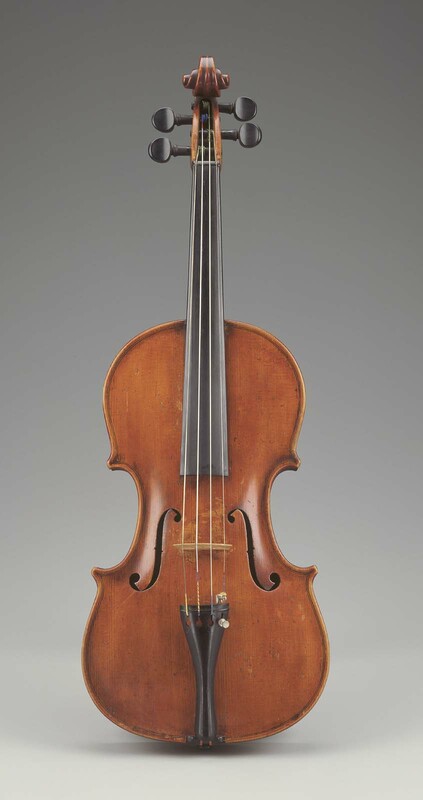 Five playing strings are held by ivory buttons inserted in the tail-piece; they pass over a movable bridge, over the nut and are fastened to five lower pegs. 2. Seven sympathetic strings of thin steel wire are fixed by ivory buttons to an inclined cross-bar glued to the belly and pass through a narrow slit in the bridge, under the finger-board through the neck clearance space, over the auxiliary ivory nut below the main nut (which also has a clearance), and are affixed to the upper seven pegs. Inside construction: Two cross-bars glued to the back; small straight corner fillets; bass-bar and sound-post. Dark brown varnish. Deep model. Standard viol pattern. Flat back of maple. Belly of soft pine, slightly arched two C-holes. Ribs of maple. 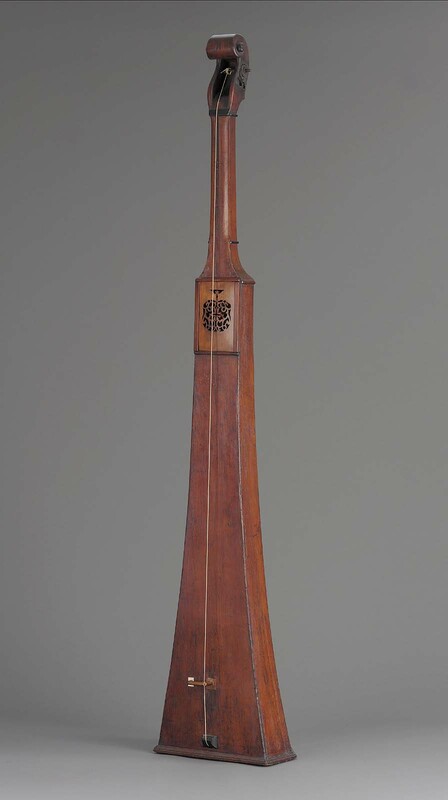 Neck of maple with a long peg-box ending in cittern-like head with inlaid square end. Finger- board of stained boxwood. Tail-piece affixed by a brass wire to the tail- pin. Ten strings; two lowest of brass wire strung singly; the remaining eight are of steel wire and strung in pairs, thus making a total of six ‘choirs.’ Ten ebony pegs. Movable bridge, ivory nut. Inside construction: corner fillets of small radius; cross strip 4.5 cm. wide and 2.5 mm. thick, glued to the back. Bass-bar and sound-post. Dark brown finish. 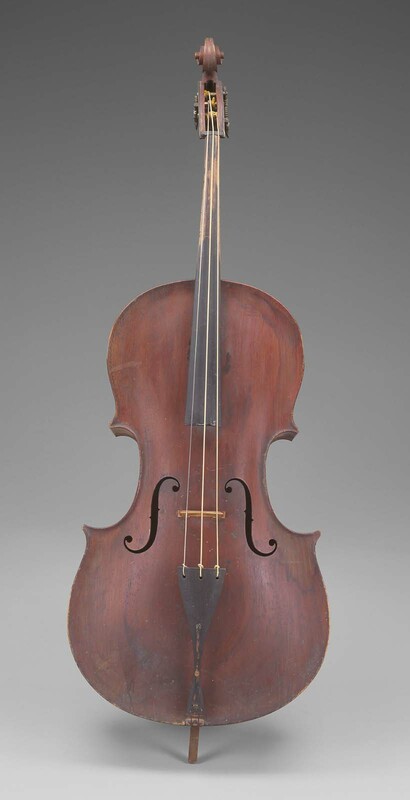 Body of a modified viol type. Back of one piece of maple, highly arched, with ink line purfling. Ribs of maple. 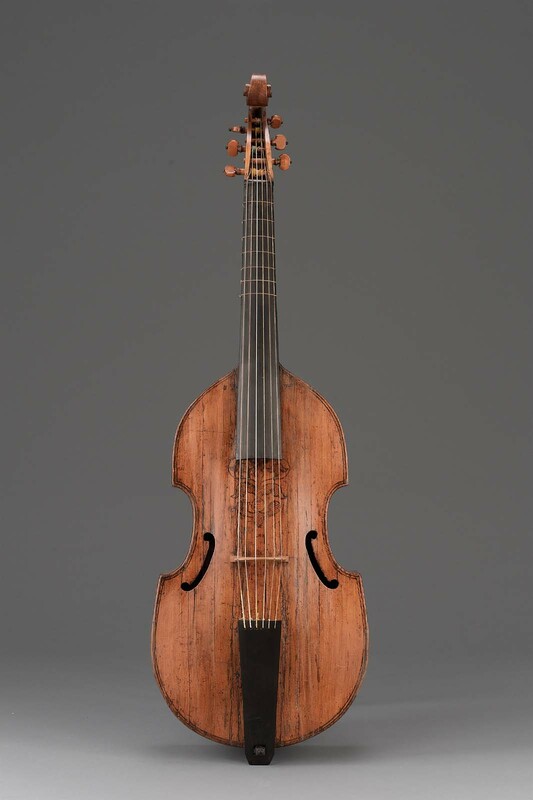 Belly of pine, highly arched, with ink-line purfling and sound-holes of the flame type. Both back and belly have overhanging edges. Neck and peg-box of maple, ending in a cittern-like head with a square end inlaid with pearl and ebony. Finger-board of stained walnut, inlaid with ivory lining. Tail-piece of black stained boxwood, with ivory inlay; affixed to the ivory tail-pin by U-shaped bent wire fastened to a silver reinforcing piece, the ends of the wire formed into rivet heads. Five double strings, four lower ones of spun silk, six higher ones of steel wire held in the tail-piece by small ivory buttons. Movable bridge with ebony top, ivory nut. No regular peg-box, instead a very solidly constructed machine head with the worm-wheels concealed inside. Internal construction of the violin type. Standard pattern. Flat back of maple, in two pieces with purfling. Ribs of maple. Belly of soft pine, slightly arched, with two C-holes. 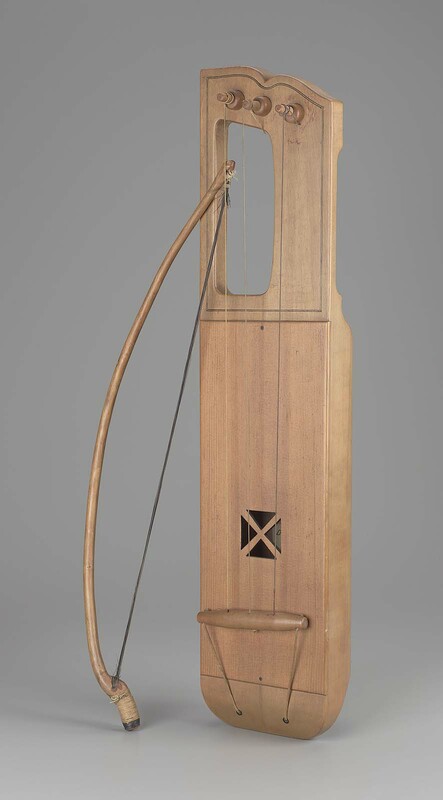 Neck of maple with peg-box and carved head of blind-folded woman at the top. Finger-board of maple, veneered with ebony; twenty German silver frets inserted in it. Hook-bar of maple, affixed to the bottom block by two turned pins with heads; tail-piece of maple veneered with ebony. 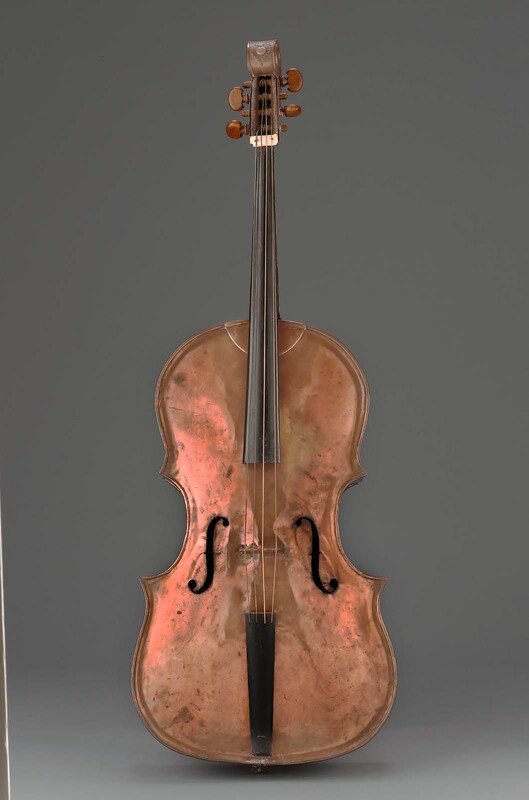 Six strings with movable bridge (violoncello type). Internal construction (as found before restoration): back reinforced by two cross-bars and cross strip 8 cm. wide and 6 mm. thick; the bend line of back reinforced by rough linen strip; regular lining at the joint of ribs and belly, but the joint of ribs and back formed of rough linen strip glued to both; circular fillets in corners; the ends of both cross-bars supported by small brackets glued to the ribs and cross-bars. Bass-bar and sound-post. Dark reddish-brown varnish. 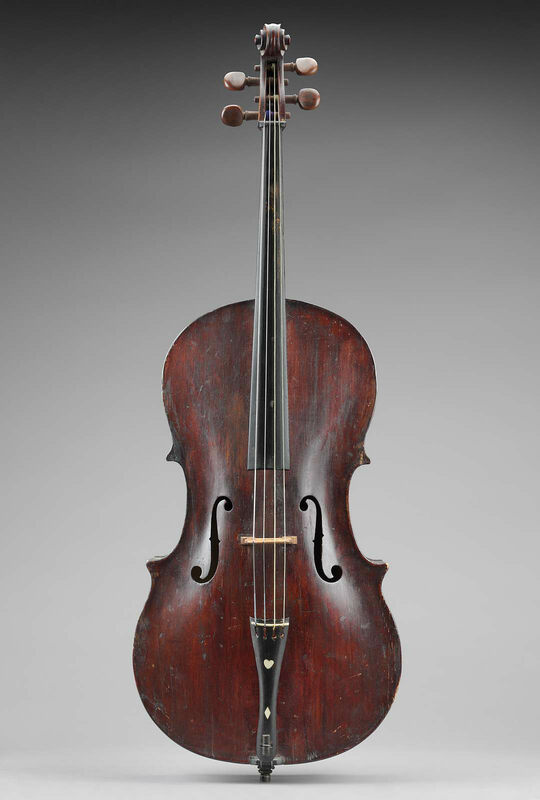 Flat back of maple in two pieces, inlaid with double-line purfling, ornamental knots, and the double interlaced monogram BN. Ribs of maple. 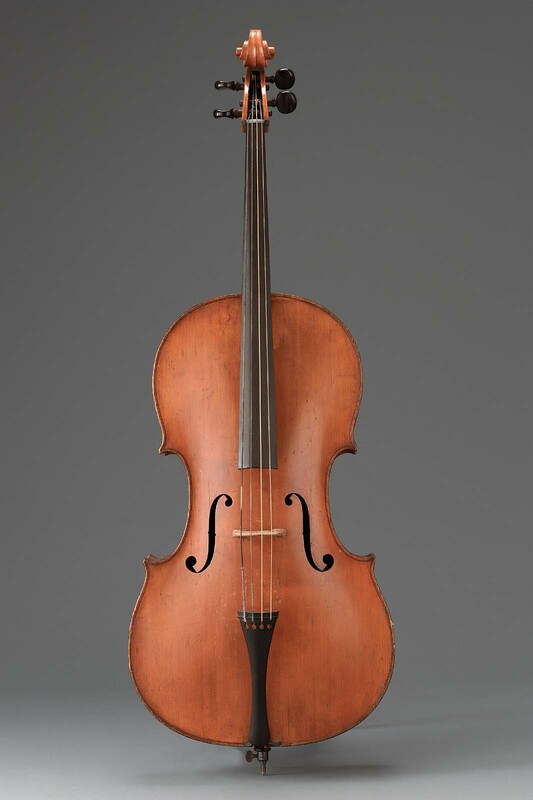 Slightly arched belly of soft pine with double-line purfling at the edges, inlaid floral design below the finger-board with medallion; two C-holes. Finger-board of maple veneered with ebony. Neck ending with peg-box and scroll, instead of carved head. Hook-bar of ebony, holding tail-piece veneered with ebony. 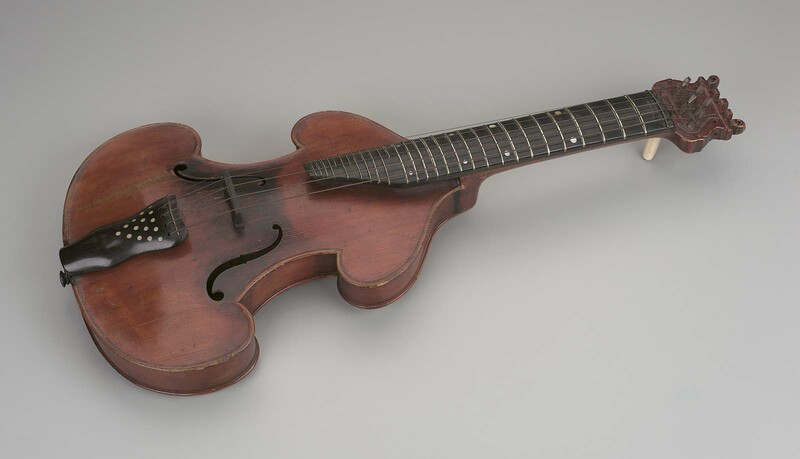 Six strings fixed to six boxwood pegs; movable bridge. Inside construction: top block separate from the neck bracket; back reinforced with two cross-bars and cross strip 9.8 cm. wide and 5 mm. thick; bass-bar and sound-post. Eight gut frets on the neck. Light yellow varnish. Flat back of maple, in two pieces. Ribs of maple. Belly of pine, slightly arched, purfled; two flame-shaped sound-holes. Narrow neck with peg-box adorned with grotesque man’s head. Finger-board of stained boxwood. Tail-piece of ebony, embellished by three inlaid ivory discs, fixed by the gut-loop to the tail-pin. Five strings. Inside construction: Corner fillets of large radius; two cross-bars and cross-strip, 6 cm. wide and 3 mm. high, glued to the back. Bass-bar and sound-post. Dark reddish-brown varnish. 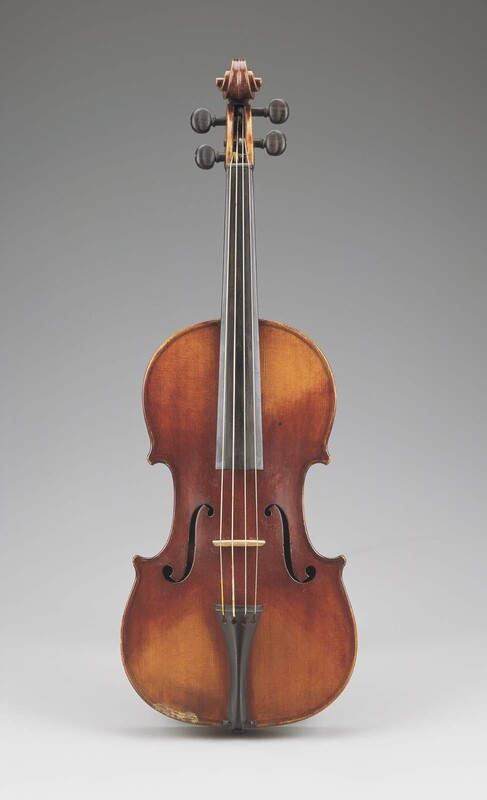 Long, shallow model, influenced by violin type. Flat back of maple, in two pieces. Ribs of maple, apparently cut down. 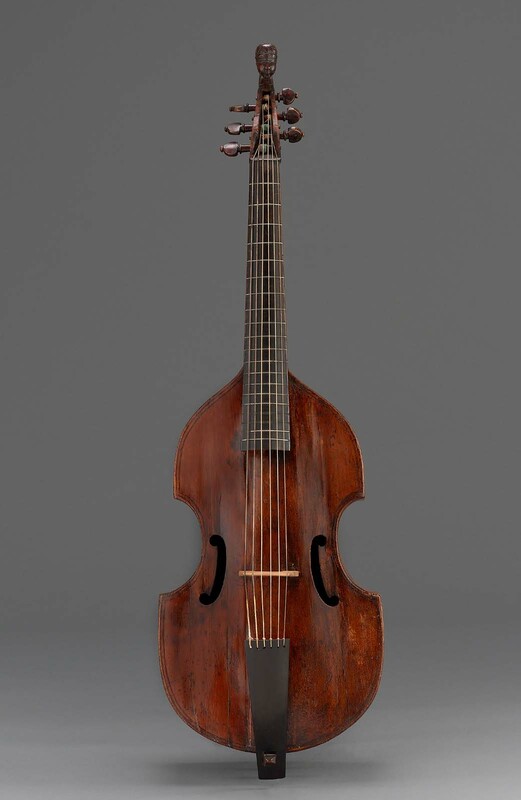 Belly of pine with raised edges and purfling; scimitar-shaped sound-holes; rosette with the three feathers of the Prince of Wales under the finger-board. 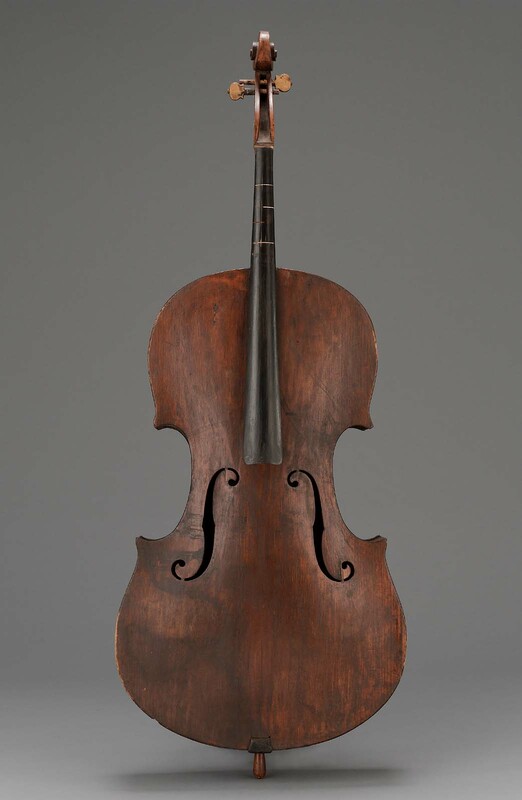 Back fitted flush with ribs, belly with overhanging edges as in the violin. Neck and peg-box of pearwood, the head bent back and ending in a square similar to that of English guitars. Finger-board of ebony. 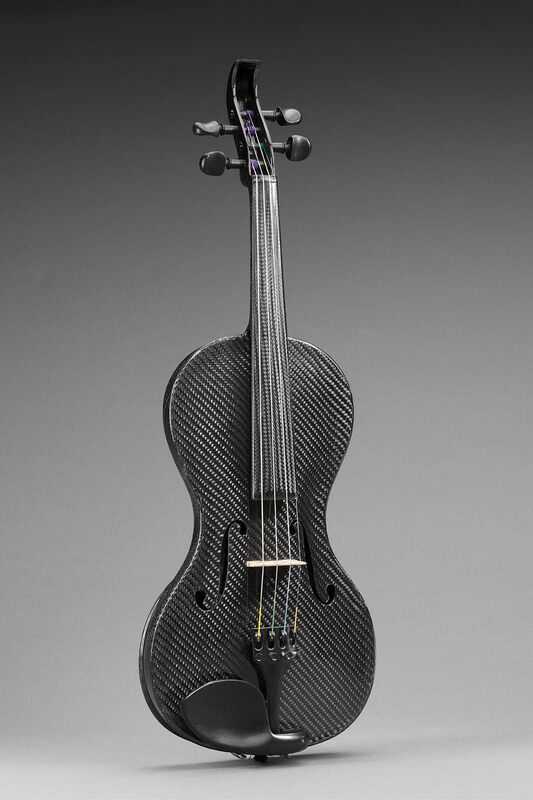 Tail-piece of ebony, with slanting top; attached in violin fashion is an end-pin. Five gut strings pass over the violin type bridge (original one lost). Five box-wood pegs. Inside construction: corner blocks as in a violin; two cross-bars and a wide cross- strip glued to the back; deep bass-bar; sound-post. Grayish-brown varnish. Deep body of complicated curved outline (modified guitar-fiedel type). Flat back of maple, made of one large piece. Ribs of maple: the ribs of the lower bouts fixed to a solid block of maple composing the outer portion of the bottom block. 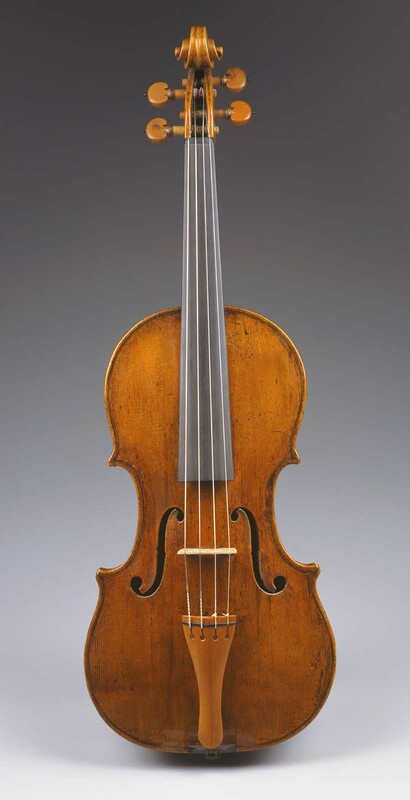 Slightly arched belly of pine, with a double purfling at the edges; four comma-shaped sound-holes; an oval rosette below the finger- board. 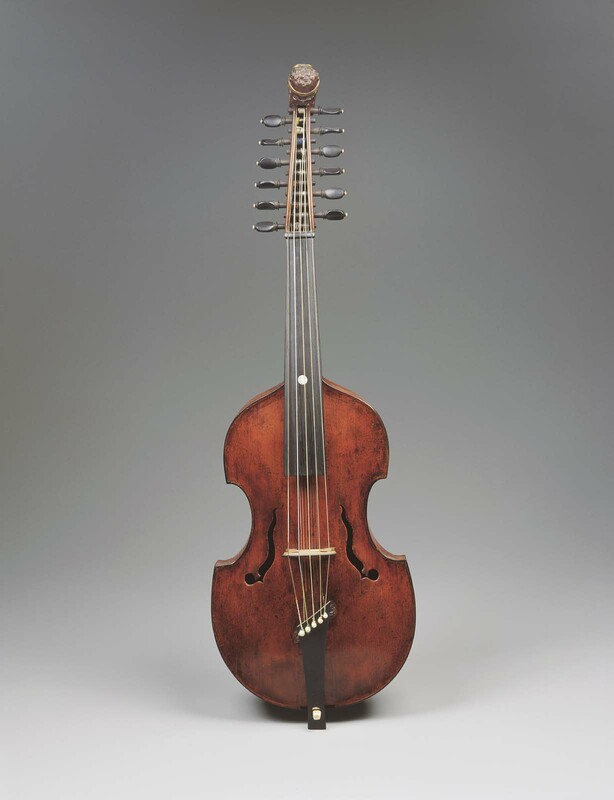 Neck and peg-box made of one solid piece of maple; the neck with a wide opening, providing the clearance for the sympathetic strings; peg-box with the rear wall pierced with four ornamental openings, surmounted with a winged Cupid’s head; bored for nineteen pegs. 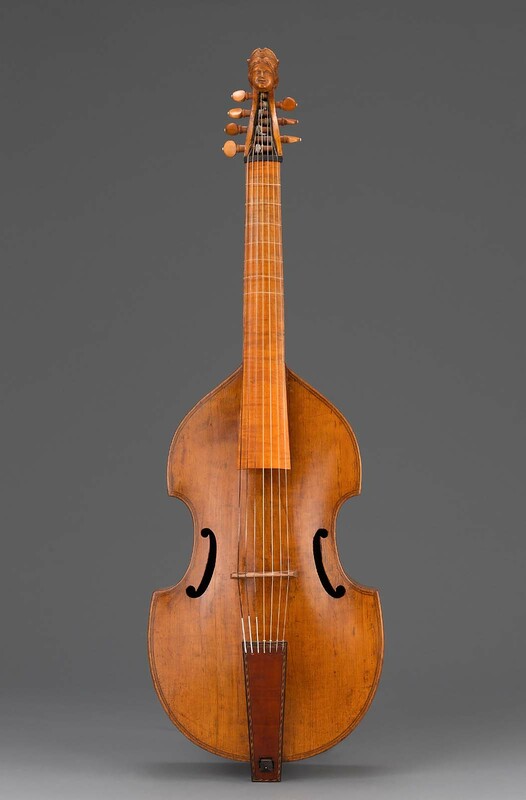 The opening of the neck covered over in front by a wide board, forming the support for the finger-board located at the left side of neck; the right-hand side of this board embellished by the open fret-work and double purfling. Finger-board of ebony nine frets of walnut, inlaid flush. Ebony hook-bar affixed to the bottom block. Tail-piece of ebony with open fret-work. Movable bridge with widely separated legs providing clearance for sympathetic strings. Twelve ebony blocks affixed as follows: 1. 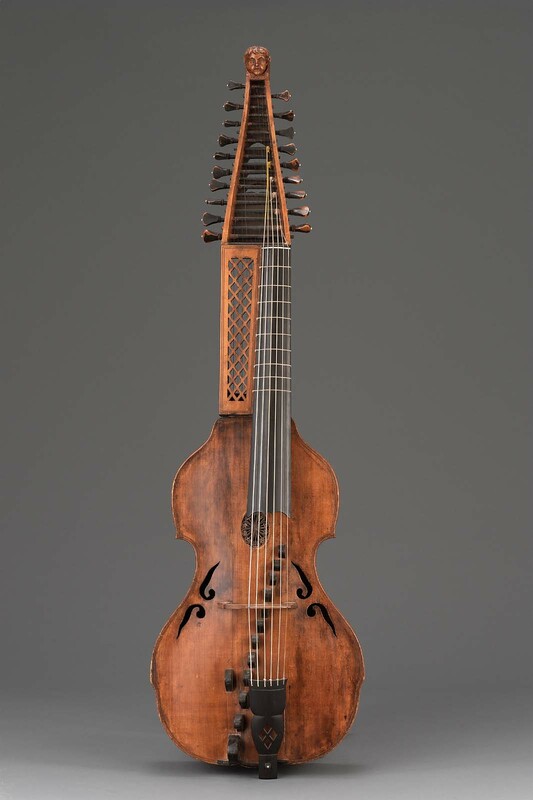 Six playing strings, three of spun silk, three of gut fixed to the tail-piece, passing over a movable bridge, over ebony nut with a narrow ivory insert and fixed at the upper end to six tuning pegs located on the left side of instrument. 2. Thirteen sympathetic strings of thin steel wire affixed to small iron pins in the bottom block, passing over the ebony saddle, and over ebony blocks (one for each string) serving as auxiliary bridges; under the neck supporting board so that they are accessible from the rear; over a wide nut fixed to the bottom wall of peg-box, to the pegs. Inside construction: Very wide top block providing a flat surface for holding the neck bracket. The lower block, consisting of two parts: the above-mentioned maple block and reinforcing block of pine. Corner joints of ribs reinforced by pine blocks. Back heavily reinforced as follows (counting from the top): (a) cross-bar with two corner pieces; (b) cross-strip 3 cm. wide and 6 mm. thick; (c) cross-bar in the middle bout; (d) cross-strip (under the sound-post) 5 cm. wide and 6 mm. thick; (e) cross-bar slightly below the joint of the middle and lower bouts. Bass bar and sound-post. Elongated body with incurved sides and flat back. Belly of soft pine highly arched, formed by a part of cylindrical surface with rectilinear generator. Ribs of maple, formed of four pieces, shallow in the upper part and wide in the lower part. 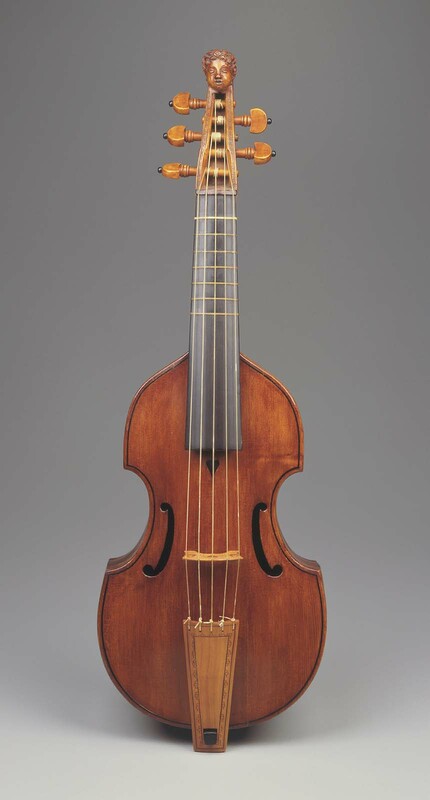 Two narrow parallel rectangular slits on the belly serve as sound-holes; in the upper part of the belly a crude rosette, partly covered by finger-board. Neck of oak, integral with leaf-shaped peg- board. Finger-board of maple. The bottom joint of lower bouts reinforced by thin rectangular strip fastened by two button-headed pins; the pin close to belly serving as a tail-pin for tail-piece, three gut strings, movable bridge, nut. Tuning pegs of sagittal posterior type with arrow-shaped heads; strings fastened in front. Sound-post, no bass-bar. Edges of belly, sound-slits, and rosette are embellished with zig-zag and dot pattern burned in wood. 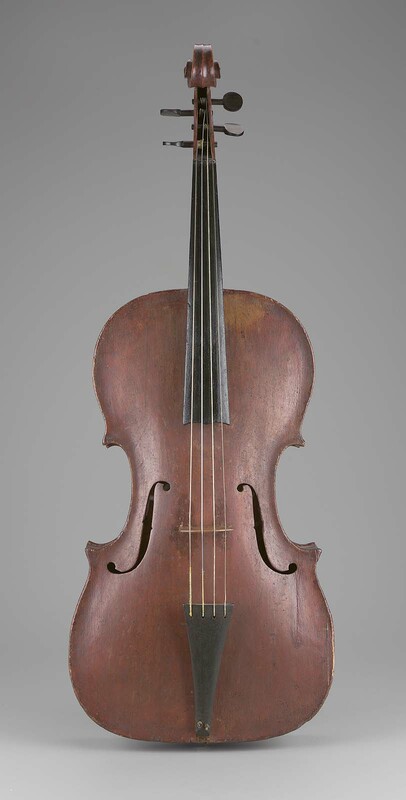 Body of violin type. Back of maple, belly of pine; both are very highly arched. Two f-holes. Finger-board and tail-piece inlaid with walnut and bone checkered patterns. Neck and peg-box of maple; peg-box is bored for eight pegs, end with small violin-type scroll. Two sets of strings: (1) four playing strings of gut; (2) four sympathetic strings of thin steel wire passing under the finger-board through clearance space in the neck. Movable bridge with two vertical notched brass pieces, permitting the change of tension of sympathetic strings. Bass-bar and sound-post. Handwritten label: Erik Johnsen / Hellund 1800; stamped on bridge: [maker's stamp] / PAMPL. 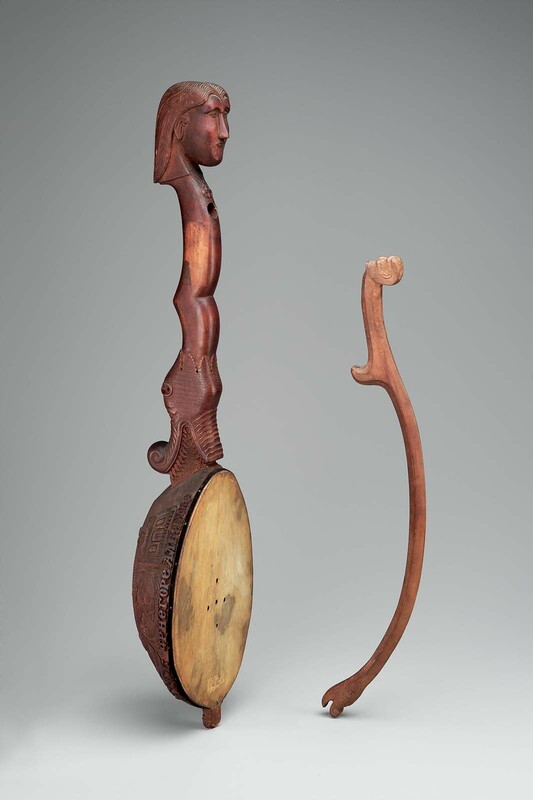 An elongated oval body with very small middle bouts, carved with its neck and peg-board from a solid block of pine. 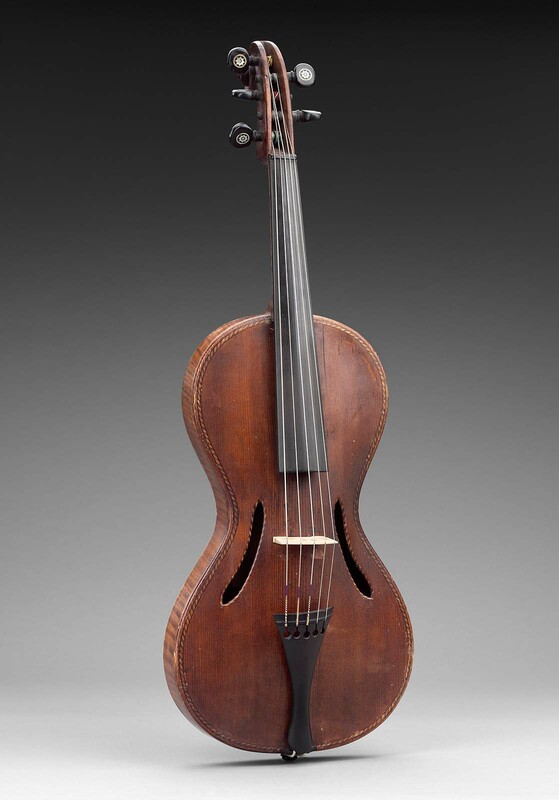 Highly arched belly of pine, with two large oval sound-holes and one small heart-shaped hole beneath the key-box. The key-box is attached to the neck and contains twenty-three keys with tangents. 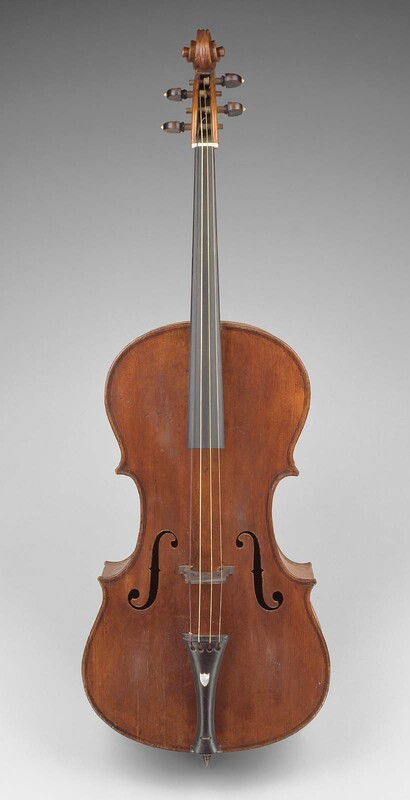 Fourteen posterior sagittal pegs, of which eight are inserted in the peg-board and six in the neck; the peg for the chanterelle string has an extra large and long head for convenience of tuning. 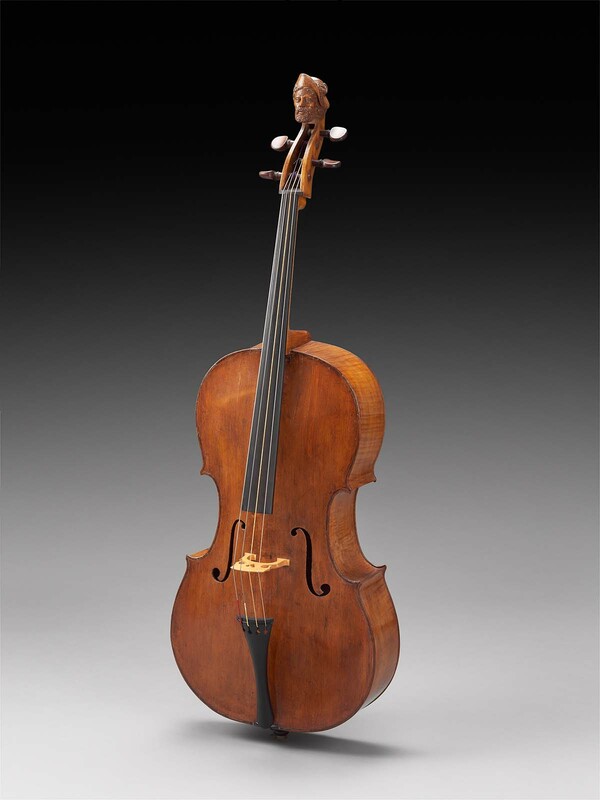 Four playing strings, three of which are of gut and one (bass) of wound wire; the chanterelle is stopped by nineteen keys; the second melody string is stopped by four keys; ten sympathetic strings of thin steel wire. 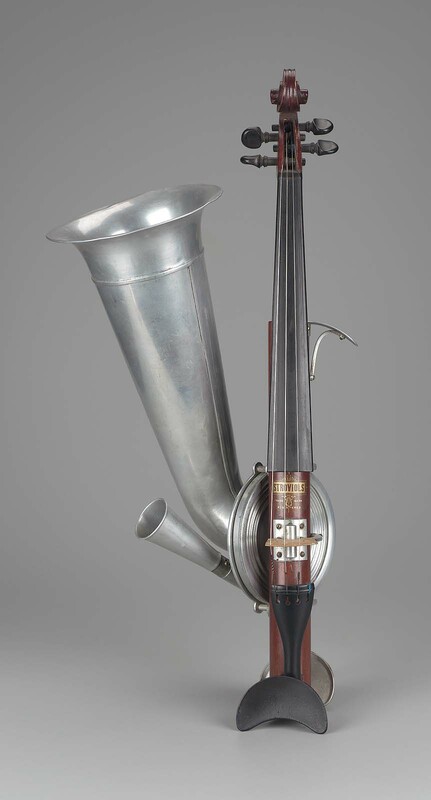 Tail-piece of maple, stained black, with a long stem ending with a hook which holds it at th the lower end of the sound-box; the tail-piece is prevented from shifting by a gut loop attached to the end-piece carved integral with the body. The upper wall of the key-box is provided with holes for strings serving as a primitive nut. The bridge of maple has a peculiar shape, very slightly curved at the top. The sound-post has square ends and cylindrical middle part; loosely fitted against the belly, but mortised into the back and held in position by a wedge inserted in the hole in the back. Gayly colored, hand-woven, woollen belt for holding the instrument is attached by two leather loops. Shallow sound-box of modified viol form. Back of two pieces of maple. Ribs of maple. Belly of pine with two narrow f-holes, purfled. 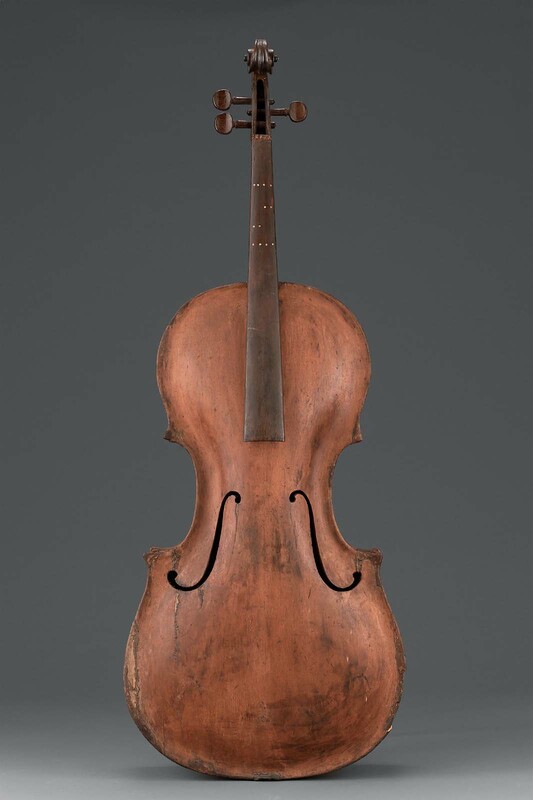 Both back and belly with overhanging edges as on violins. Neck and peg-plate of maple. 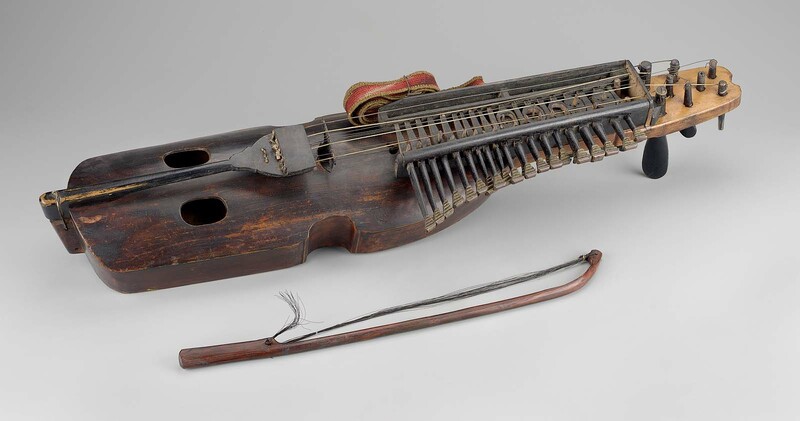 Ebony finger-board with twenty-nine brass frets. Three ivory pegs at the back, serving a supporting points of instrument on a table. Five strings: the two higher ones of steel wire, the lower three of spun silk. Frontal type of string tuning end fastening; anterior pegs of round steel with square ends. 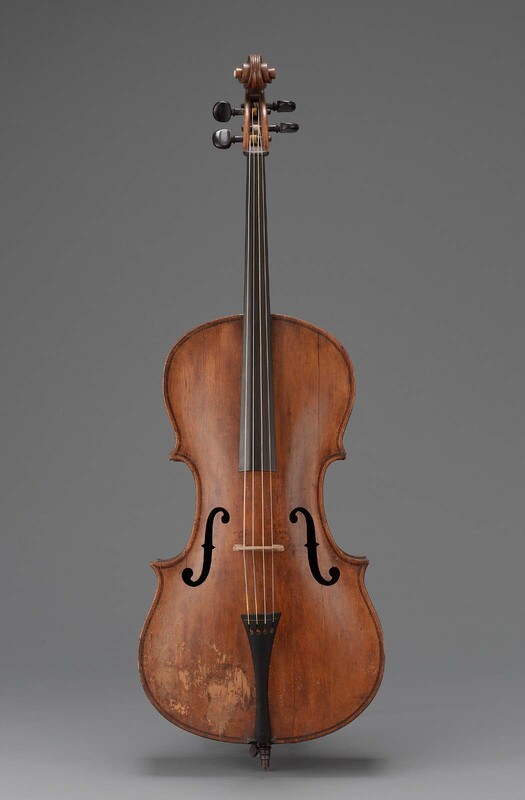 Inside construction: no corner blocks (owning to the peculiar outline of body): sound-post; bass-bar on the left side (opposite to that of violin) owing to the higher strings being located on the right side of the instrument. 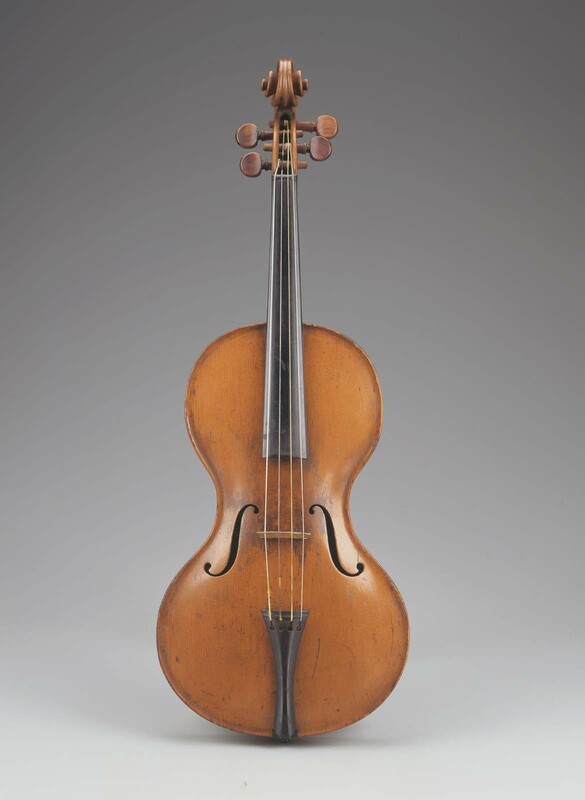 Pear-shaped body made of a solid piece of wood, with integral neck and head, and vaulted back. Sound space hollowed out and covered with pine sound-board with two semi-circular sound-hoels. Three gut strings attached by wire loops to a boss at the bottom; movable bridge; two outer strings are attached in front directly to the sagittal posterior pegs, the middle strin being guided by a small slotted peg. At the back oif the head there are reinforcing bosses providing extra stock for tuning peg-holes and supporting trefoils of the head-board. Bottom, sides, and belly of maple. Rope-pattern binding of ivory and ebony along edges of belly. C-shaped soundholes. Pegbox of maple with carved human head. Key-box of maple attached to the belly and to the peg-box; hinged cover, of birch veneered with ebony, attached to the key-box. Six sagittal anterior pegs of oak stained black. Twenty-three keys of pearwood inserted in the key-box, each key having two tangents: thirteen naturals with plain heads stained dark-brown, ten sharps with ivory heads. Six strings, occipital fastening; two chanterelles passing over a nut close to the peg-box through the clearance between the key-box and its cover, over the bridge and attached to the tailpiece; trompette string passing over the auxiliary nut on the right side of the key-box, over the small bridge (lost) and attached to a small ivory bracket on the rib at the lower end; a mouche string passing over the same nut and over the right side auxiliary bridge, and both fixed to the small ivory bracket on the rib. Rotary friction wheel of maple mounted on the steel axle with crank and ivory handle: all the strings are vibrated by this friction wheel. Tailpiece of maple veneered with ebony, permanently fixed to the end block. Long ivory peg in the tailpiece for the auxliary string controlling the trompette string. Small vertical ebony peg inserted in the belly (used for hitching the trompette string). Half-cylindrical wheel guard veneered with ebony and set between two ebony brackets on the belly. Three turned mahogany pins in the ribs for the holding strap. Inside construction: top and end blocks of pine; two crossbars on the back; the soundpost, forked at the upper part, placed directly under the main bridge. Light yellow varnish. Beautifully fluted stick of mahogany. The frog and the button of ivory; screw and nut adjustment. Eight semicircular flutes extending the entire length and blending into the head flutes; at the frog end are raised lines (20.5 cm. long) in the hollow of the flutings. The head with a long peak is nicely fluted. Round stick of oak. Ivory frog and button; screw and nut adjustment. At the frog end the stick is octagonal for approximately 12 cm. The frog has a rounded outside corner and a semicircular cutout for the middle finger. Rather large and clumsy head, with ivory plate partly covering the face of head. Cramer type. Round stick of lancewood with very small negative camber; hatchet type head. Ivory frog, cutout at both ends, with ebony slide and German silver ferrule. Ivory button; screw and nut adjustment. Straight round stick of oak, curved at the end to form the head. Ebony frog with mother-of-pearl eyes and slide. Button of German silver and ebony. Large German-style bow. Stick and frog of beechwood. Screw cap of dark hardwood. Tourte type. Finely made bow of Pernambuco with octagonal stick. Ebony frog inlaide with large mother-of-pearl shields on the sides; mother-of-pearl slide; German silver ferrule. Ivory button. Tourte type. Round stick of Pernambuco. Ebony frog with mother-of-pearl slide and German silver trimmings. German silver and ebony button. Ordinary commercial bow. Stamped on stick: A. W. WHITE [and] PAT. FEB. 22. 87. 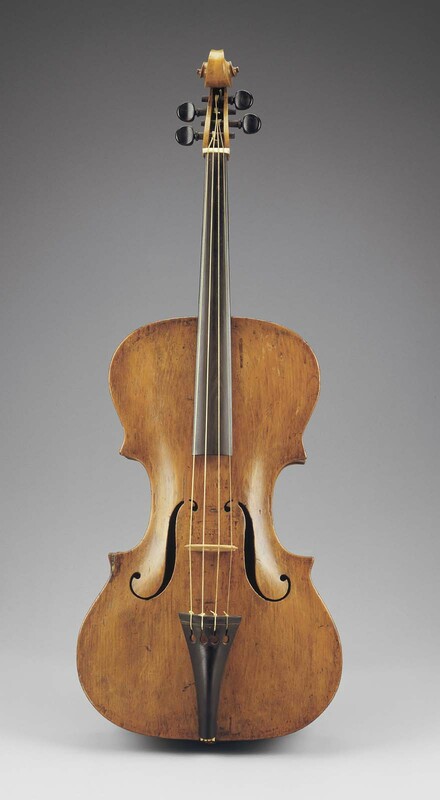 Pear-shaped body made of a solid piece of poplar tree wood, with an integral neck and peg-box; vaulted back. Sound space hollowed out and covered with pine sound-board with two f-holes. Finger-board of stained oak glued to a raised step on the neck. 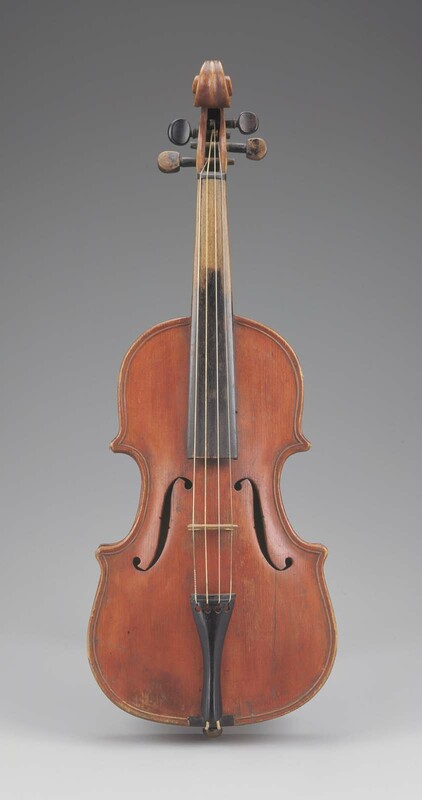 Three gut strings fixed to a leathern tail-piece, hooked to a boss at the lower end. Movable bridge and nut. Frontal type tuning end string fastening, lateral pegs. Sound-post.